Blog > A warm and sunny welcome from all of us at Ngala Lodge in The Gambia! News from Ngala Lodge about some fantastic improvements made over the summer months. 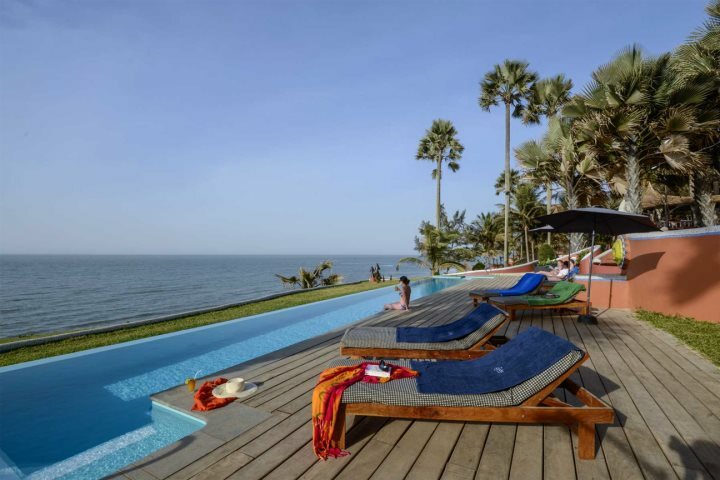 A number of people returning from The Gambia recently, including our staff and guests, have commented on how wonderful all the hotels are looking this year. As well has refurbishing, a number of hotels have made some lovely improvements to their facilities, not least Ngala Lodge, who has added a new infinity pool and 6 luxurious sea-view suites. But that’s not the only change at Ngala as you can read in this letter recently sent out to former guests from the lodge’s owner, Peter, and the Ngala Team. I trust that you are well and that the autumnal English weather is not too depressing! It’s lovely here! The Gambia Experience has given us this opportunity to write to you about the exciting developments here at Ngala. During the summer months Peter has been busy with a number of new projects designed to make your holiday even more enjoyable! Our popular restaurant has been extended further with the addition of an outside, thatched roofed, dining terrace with panoramic views across our beautiful gardens and the Atlantic Ocean. Below the restaurant terrace we have added a new lounge bar, ’Mo’s Place’ again with ocean and garden views, a great area for pre or post dinner drinks. Or just drinks! The kitchen has also been extended and guests are now able to view Jonathan and his team preparing dishes to delight. Jonathan is also more than happy to show guests around the kitchen. You may also have heard about the second pool we have installed. This is no ordinary pool, known as an infinity or "endless" pool, replete with its own jet stream current, great for swimming with or against. It’s simply fabulous. And of course we have the new Macondo suites. Six super stylish suites with uninterrupted sea views. The 3 ground floor suites also have their own, private plunge pools on the terrace. The views are amazing. And so to Ebola. The Gambia remains Ebola free having had no reported cases since the outbreaks began in Guinea, Sierra Leone and Liberia, over 10 months ago. The government is working hard to protect the borders and Senegal, which both neighbours and surrounds us, has now been declared Ebola free having had one non-fatal case in September. The Foreign Office has not changed their Travel advice to advise against travel to Gambia. To be honest we have watched the UK media coverage with some alarm and a lot of frustration. If people choose not to visit our beautiful country it will be most damaging. So we urge you to come and experience the warmth of The Gambia – the sun and its people - and the delights of Ngala Lodge again soon! P.S… Our good friends Lawrence and Linda at Mandina Lodges would also love to see you in the Gambia. Mandina Lodges would make a very enjoyable add on to stay to Ngala Lodge.